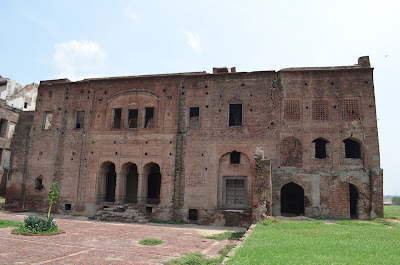 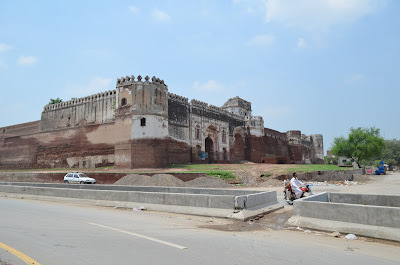 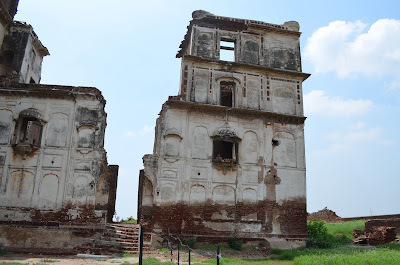 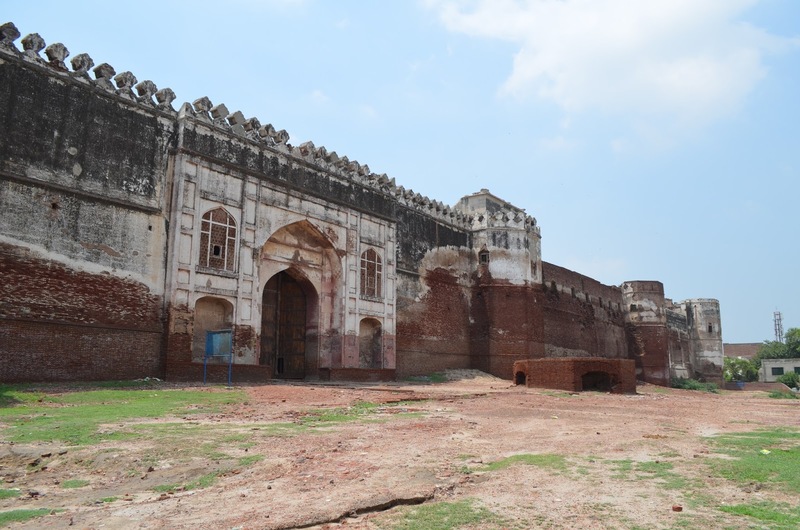 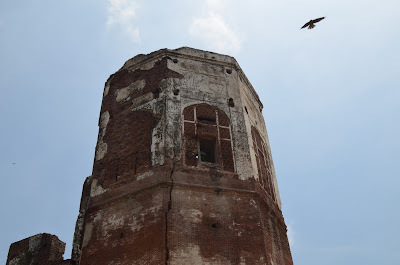 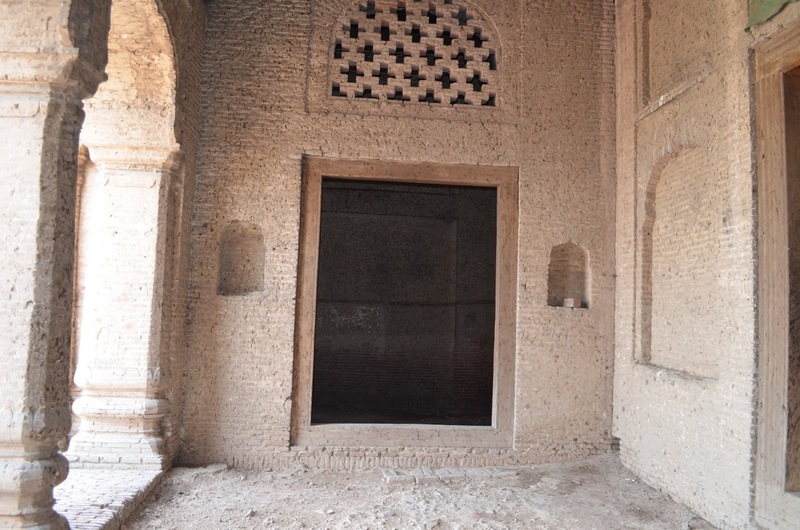 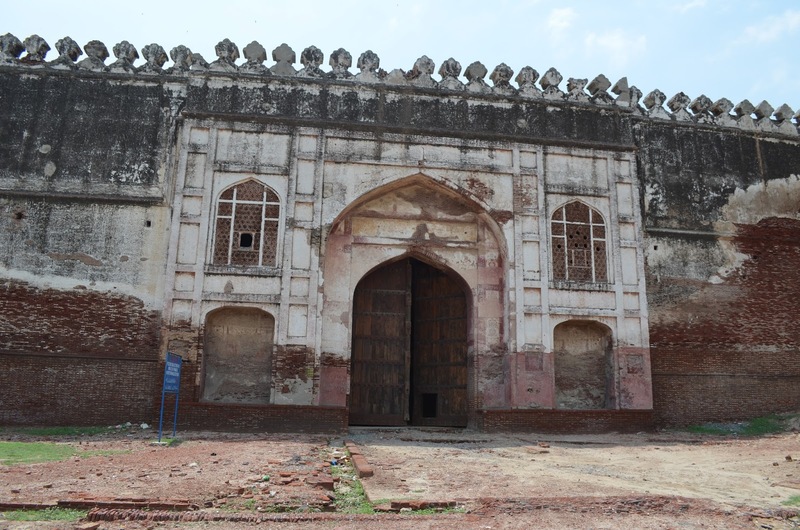 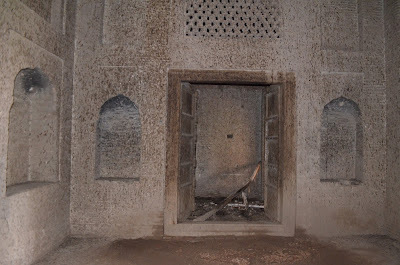 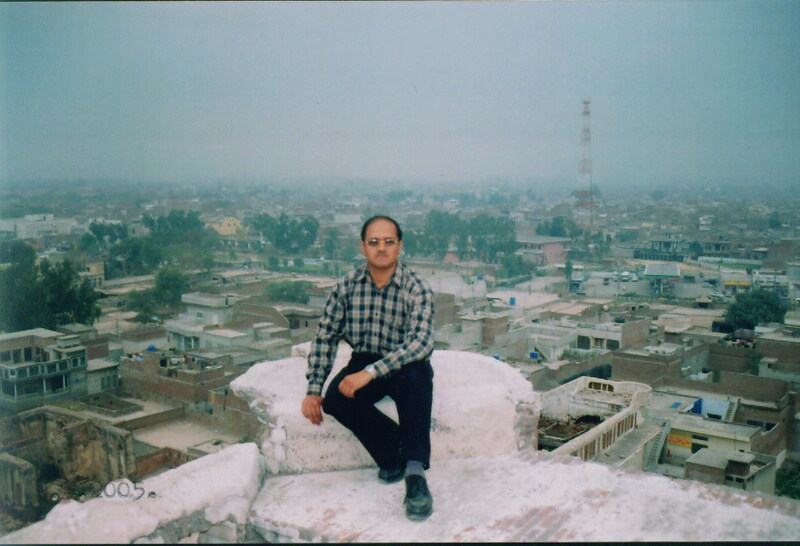 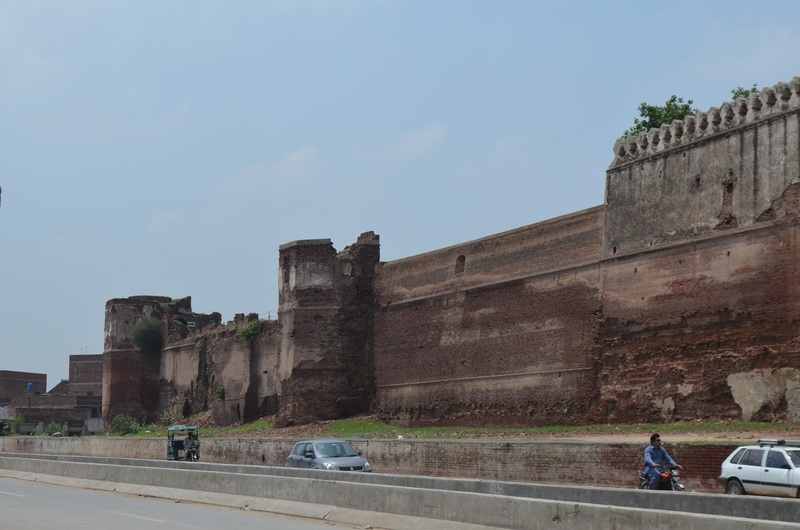 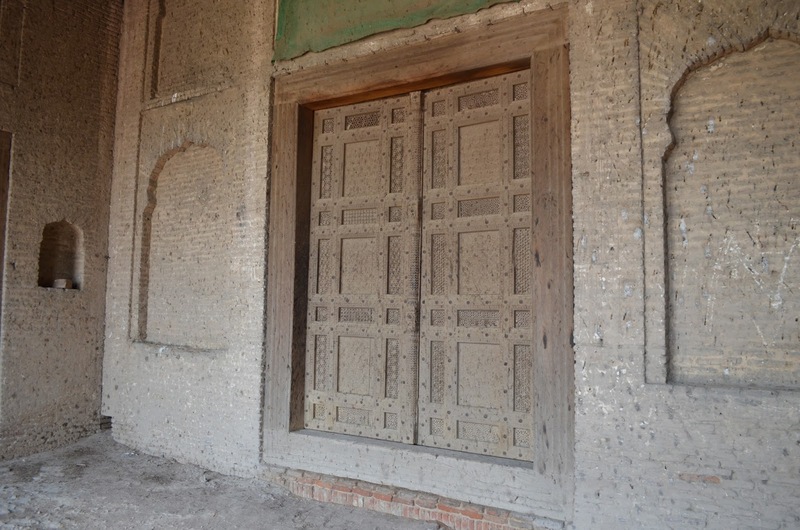 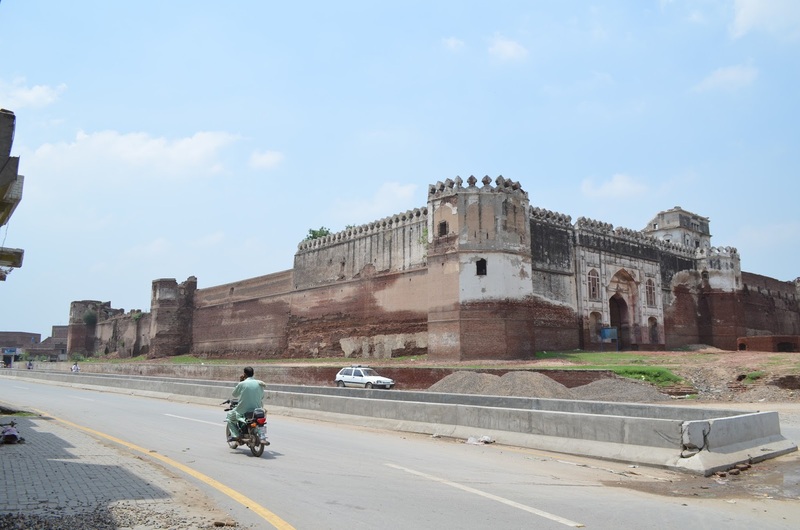 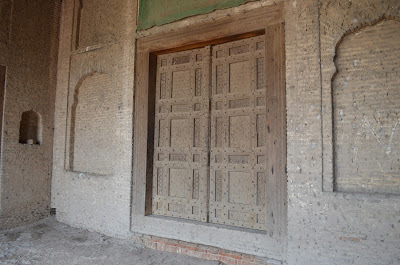 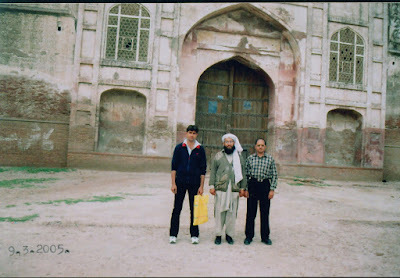 When you take a first look at the fort palace of Jahangir in Sheikhupura you are impressed. 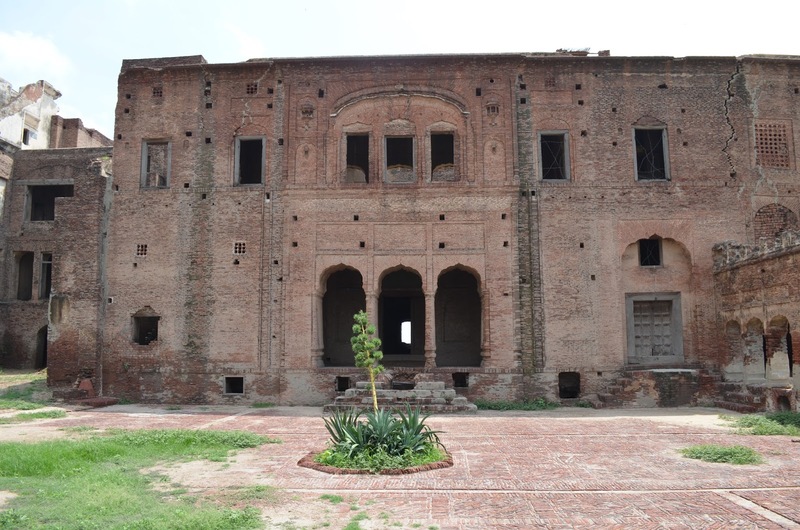 Impressed by its size and grandeur. Second, you are surprised to realize that how little have you heard or read about this palace. The third feeling is that of depression on seeing such a big, beautiful and historically important place in an advanced stage of decay. 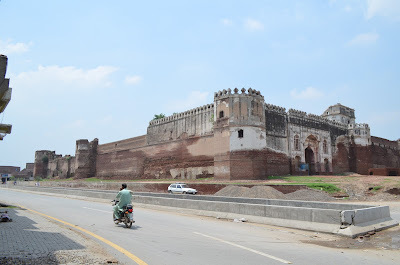 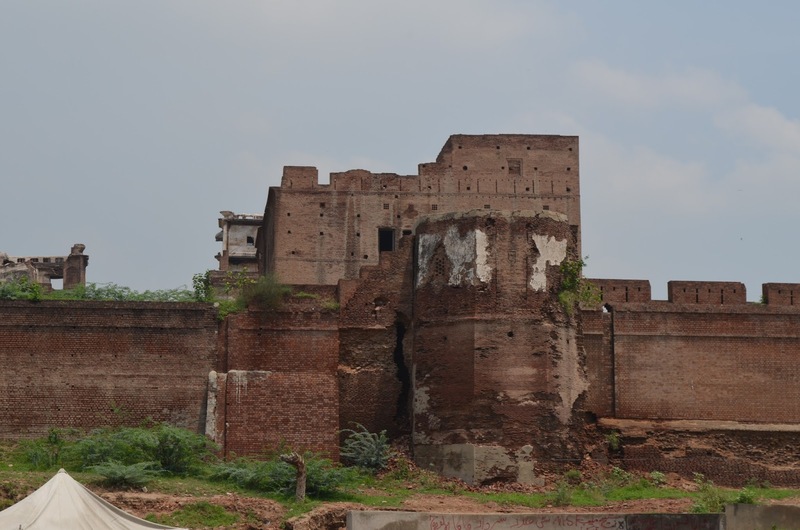 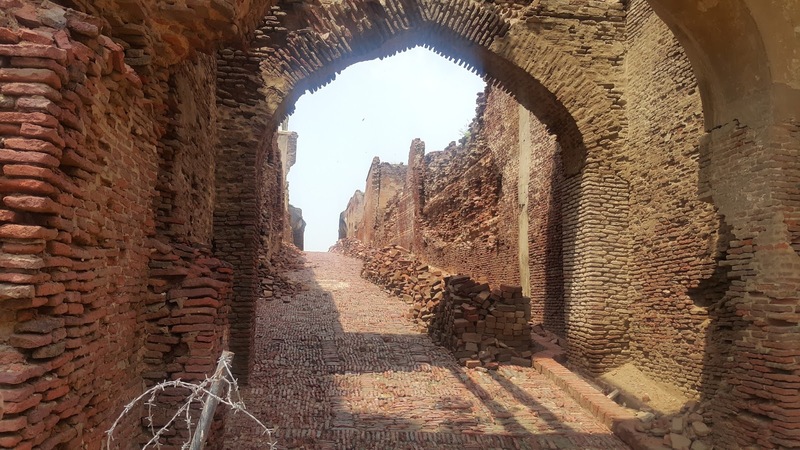 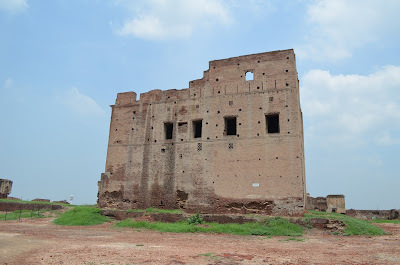 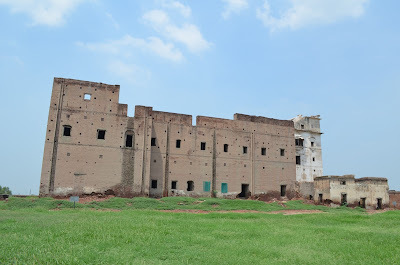 And this fort does not exist in a faraway or remote area of Pakistan, it is just 40 kms to the west of Lahore and a few kilometers away from M2, in a big city Sheikhupura. It is located at 31°42'32.65"N; 73°59'25.24"E and spread over an area of 3.5 acres. 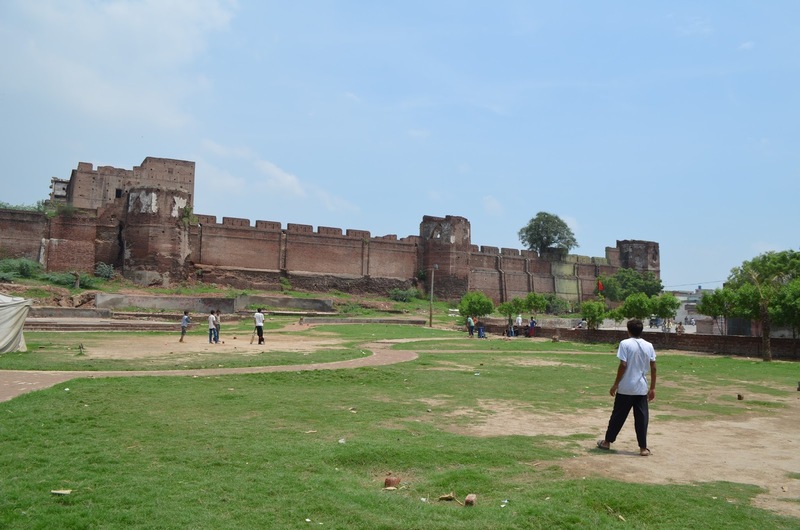 It is a fortified palace with a huge walls, with 10 bastions, adding to its strength and beauty. The fort is currently closed to the general public and visitors are not allowed inside. 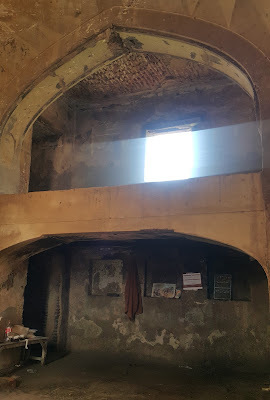 However, three watchmen were on duty and taking pity on our condition in that sweltering weather, they allowed us in to take a quick peek. 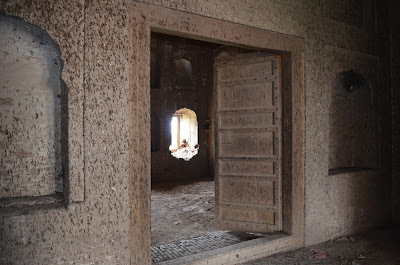 But unfortunately, the buildings inside are totally off limits to the visitors. 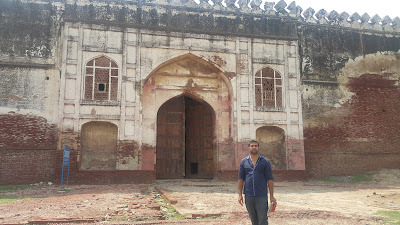 As you enter the main gate you find yourself in a big deorhi. 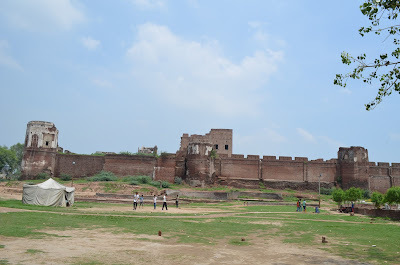 And there is a big platform which was used by the emperors or other chief occupants to ride an elephant. 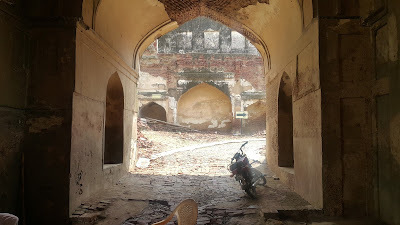 This section along with the gate is still in a strong condition, though all the decoration is lost and plaster is falling from the walls. On both sides of the deorhi there are ramps leading to the interior of the fort, passing through two huge arched ways. 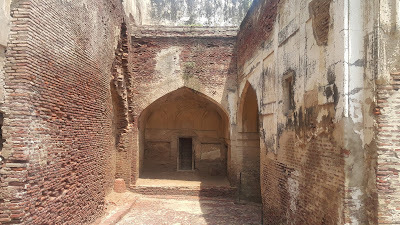 The ramp on the right side leads to the two main buildings of the palace. The ramp to the left side turns right along the western wall of the fort. The whole area is littered with broken pieces of different structures. The palace inside has two distinct buildings, both were definitely built during different times and builders. 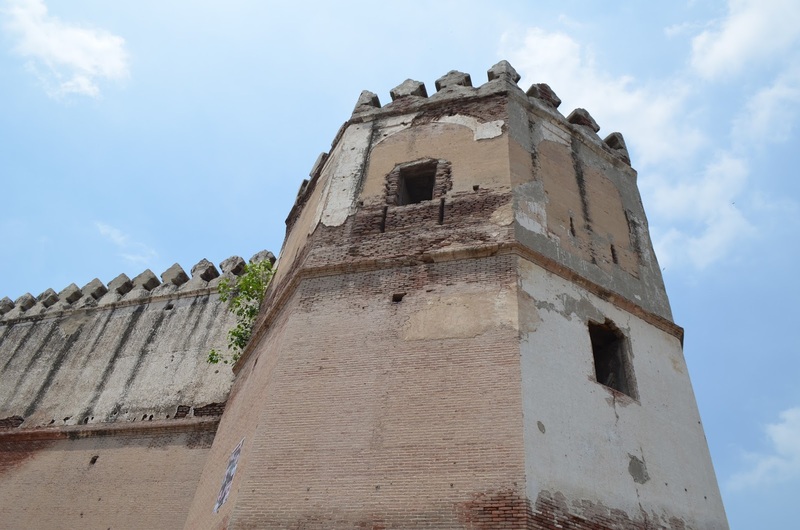 But I could not find any details about the history of their construction. 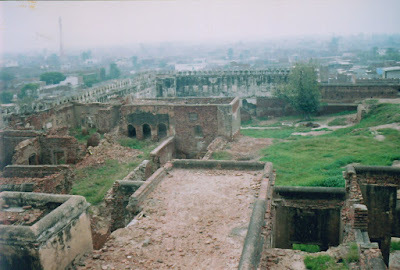 This place has failed to draw as much attention of historians as much it deserves. 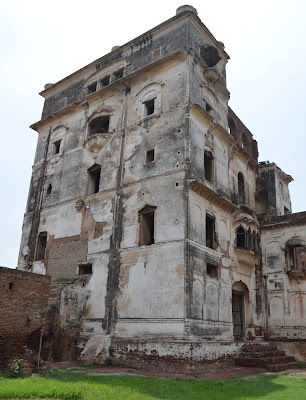 I saw a few books about the history of the Mughal architecture, but could not find anything about this palace. 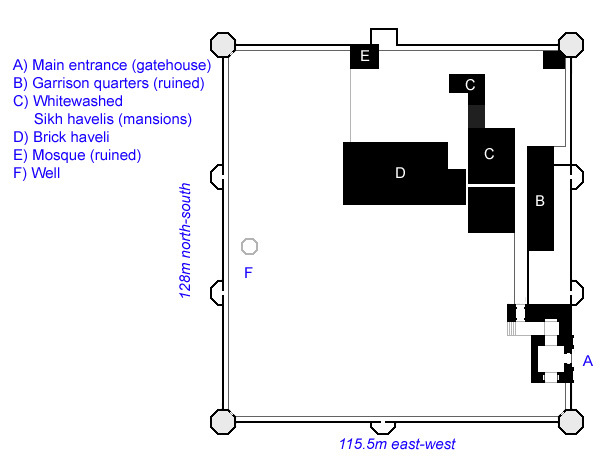 For our understanding, I shall mention the two main sections of the palace as the Building A and the Building B. 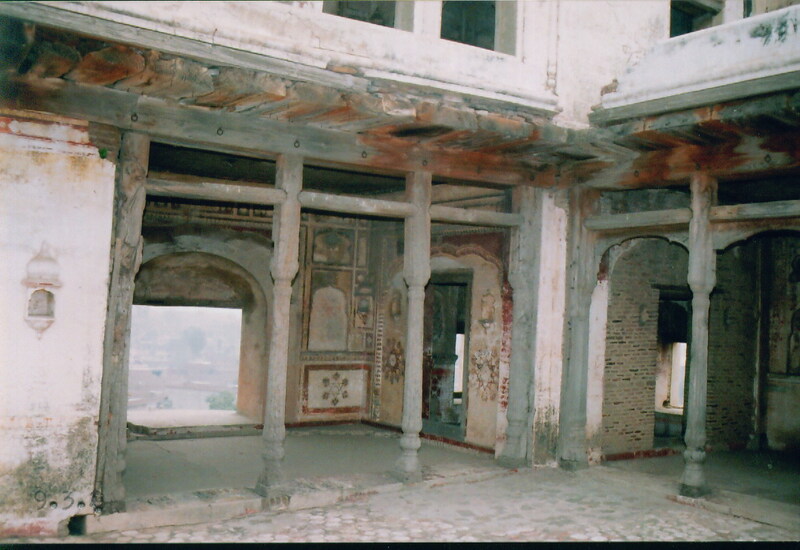 The building A is more beautifully built and decorated and probably is the older of the two. 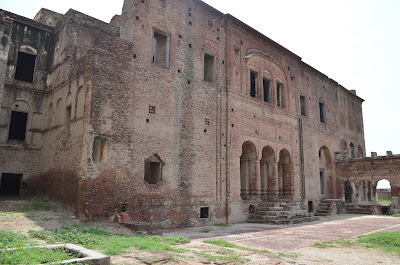 The Building B, is more solidly built but lacks the beauty, elegance and dcorations of the Building A. 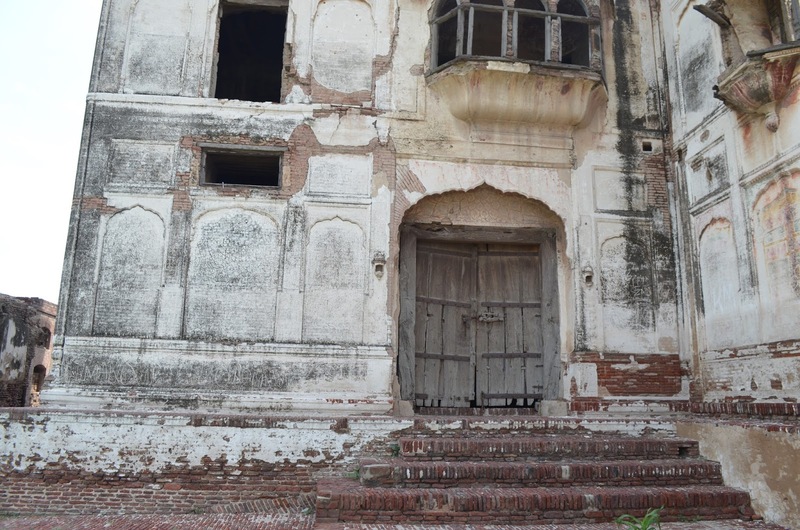 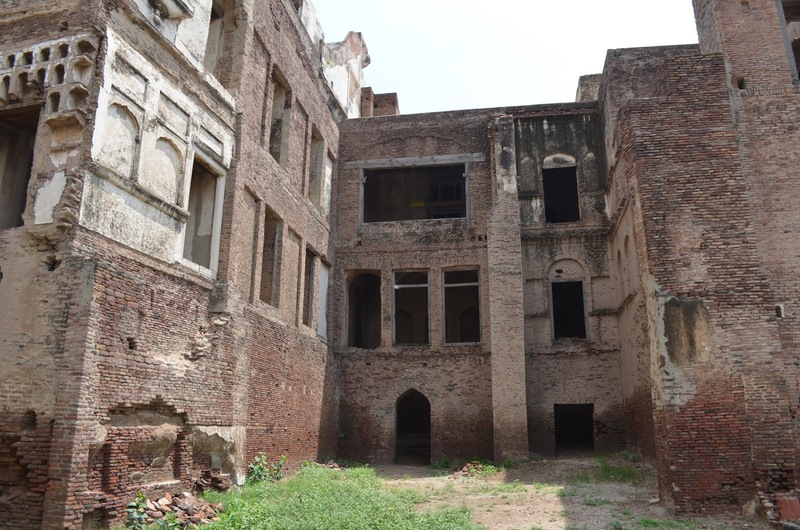 This building was most probably built during the Sikh period (starting sometime in early 1760s until 1849 in this region), as suggested by its style of architecture. 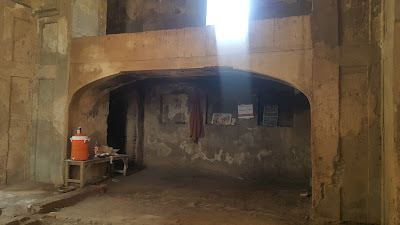 The caretakers allowed us only in this building just to check a few rooms on the ground floor. 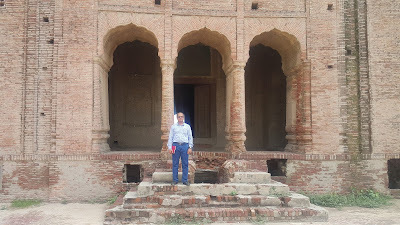 This was my second visit to this palace after 12 years. 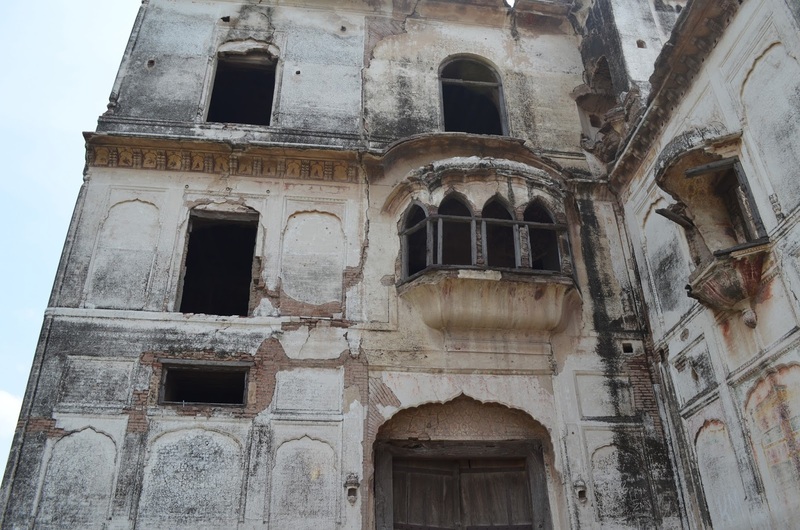 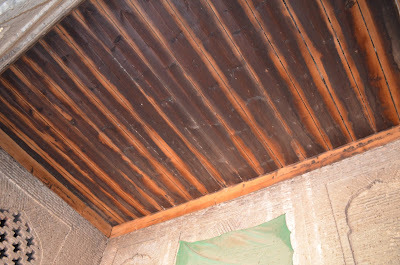 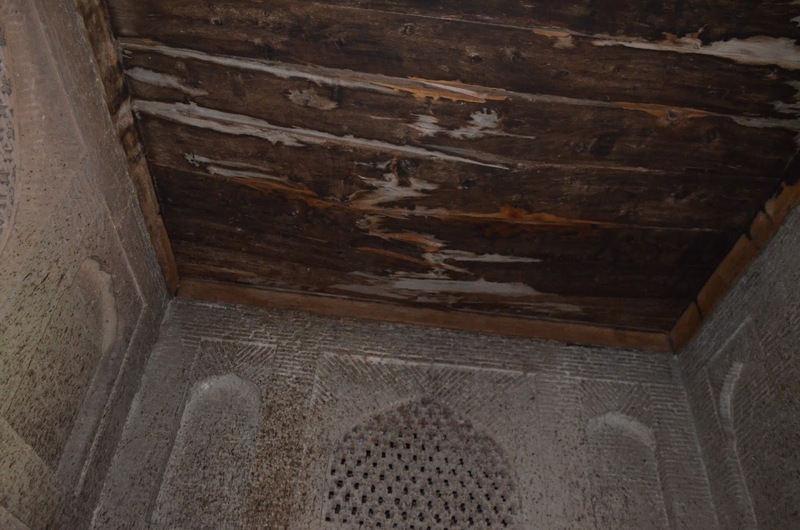 I did not notice any improvement or repair work, only a little more deterioration in the condition of different buildings. 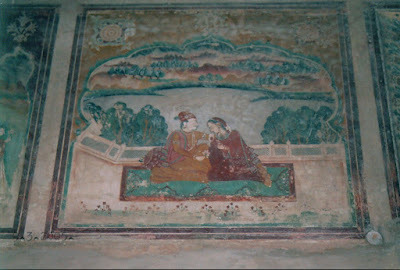 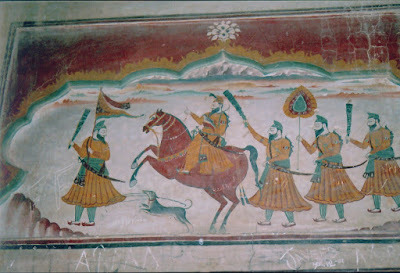 The last time when we visited it, we are allowed to enter the Palace A as well, and we saw colourful fresco on the wall. A website Oriental Architecture gives the following account of this palace. 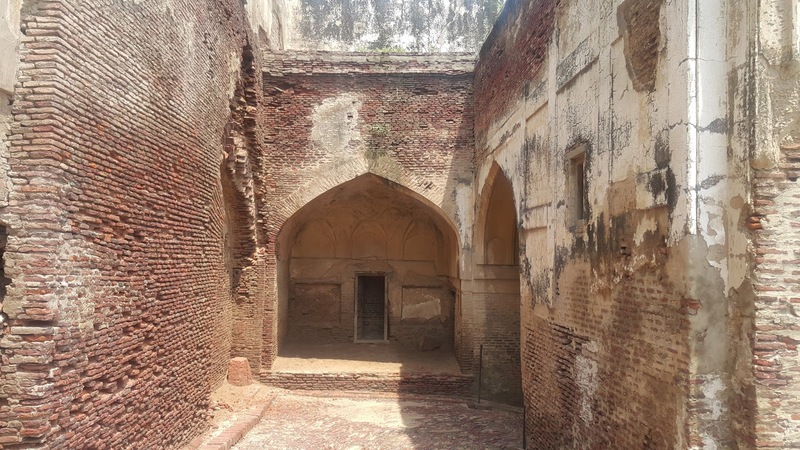 The fort certainly dates from at least the early Mughal era or earlier, and is the product of numerous modifications over the centuries. 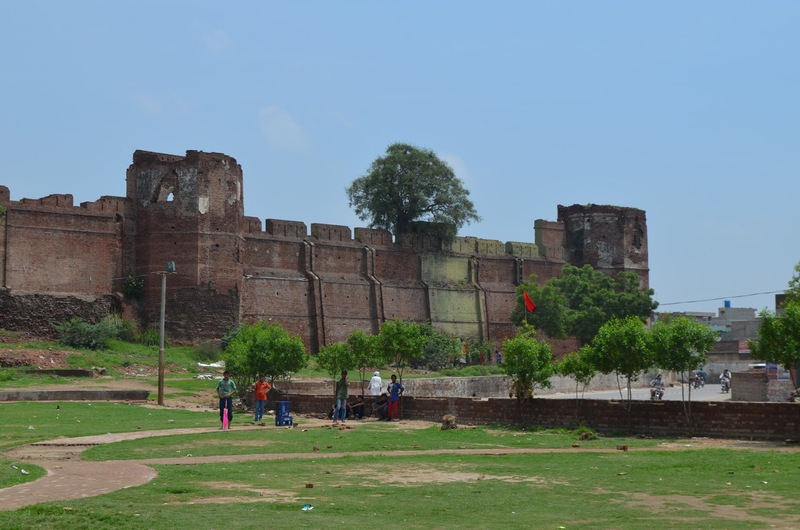 In its present form, the fort is a rough square measuring 128 meters north to south and 115.5 meters east to west, with walls averaging 11.5 meters in height. 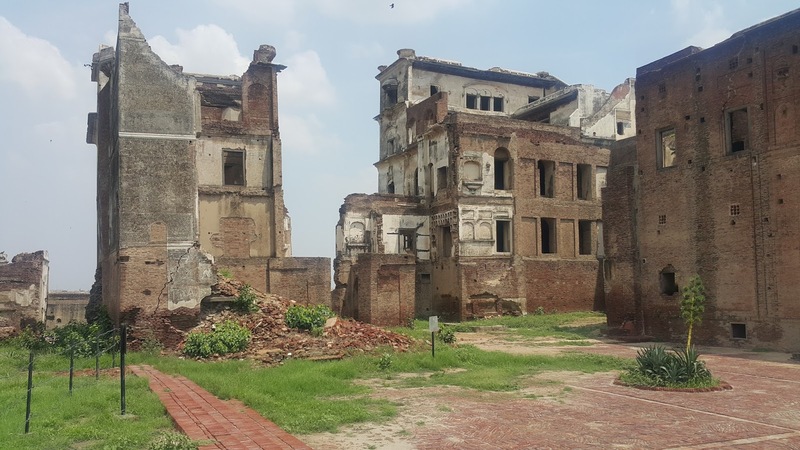 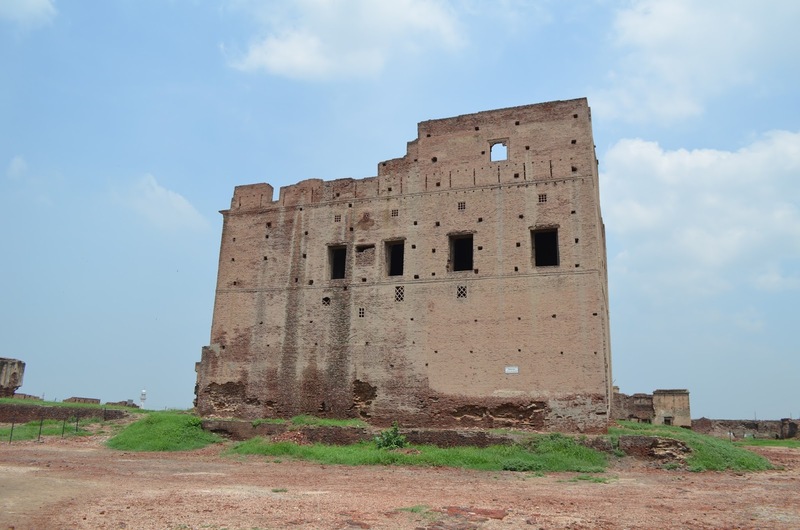 It presents a formidable appearance, and rises easily above the cityscape in southeastern Sheikhupura where it remains a distinctive landmark. 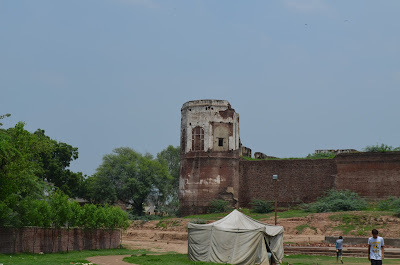 The traditional attribution of the fort to Jahangir is partly due to the proximity of the Hiran Minar tower and hunting retreat which was definitively built by Jahangir beginning in 1606. The Badhshah Nama records multiple visits to the area by Jahangir and his son, the Emperor Shah Jahan. 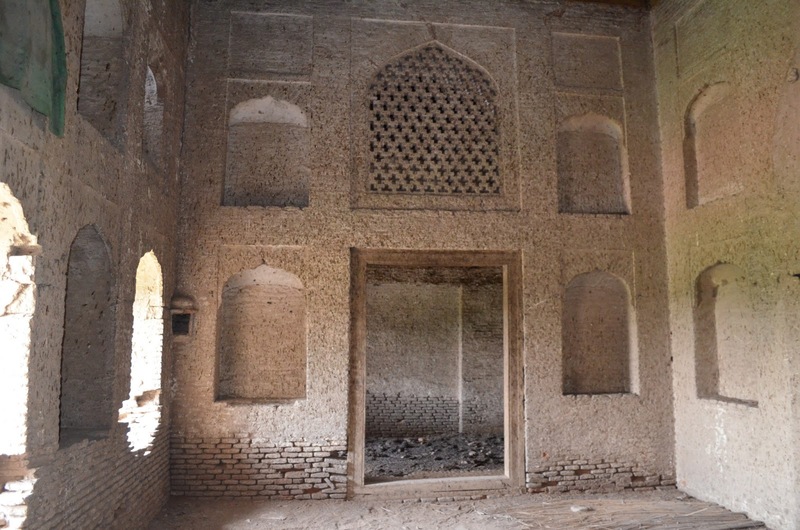 All of these visits took place between 1606 and 1646, after which the area was briefly held by Shah Jahan's son, prince Dara Shikoh. The fort would likely have been used as a camp for the Emperor and his retainers, providing more suitable accomodations than the exposed baradari and other pavilions at Hiran Minar. 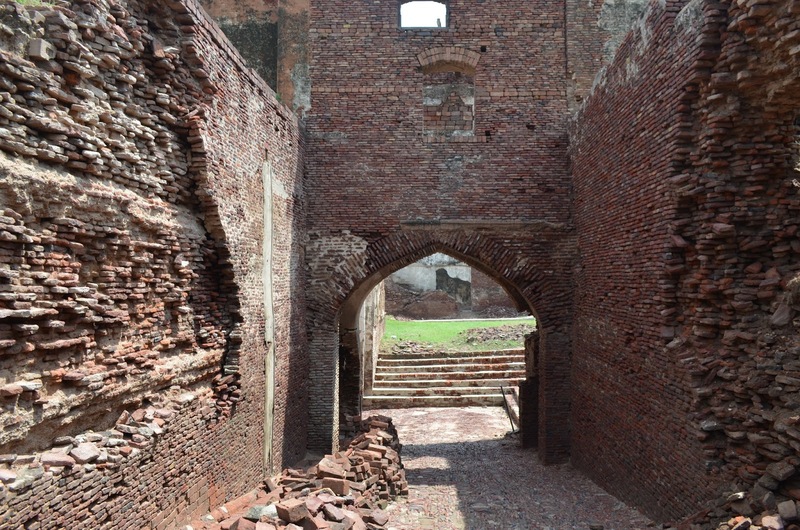 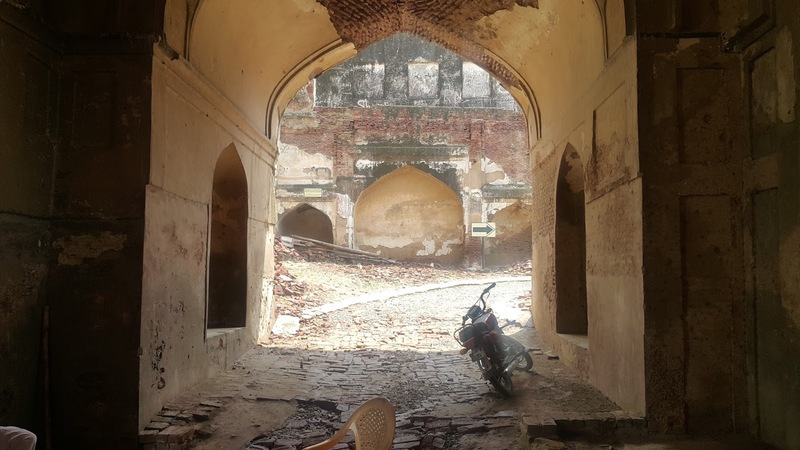 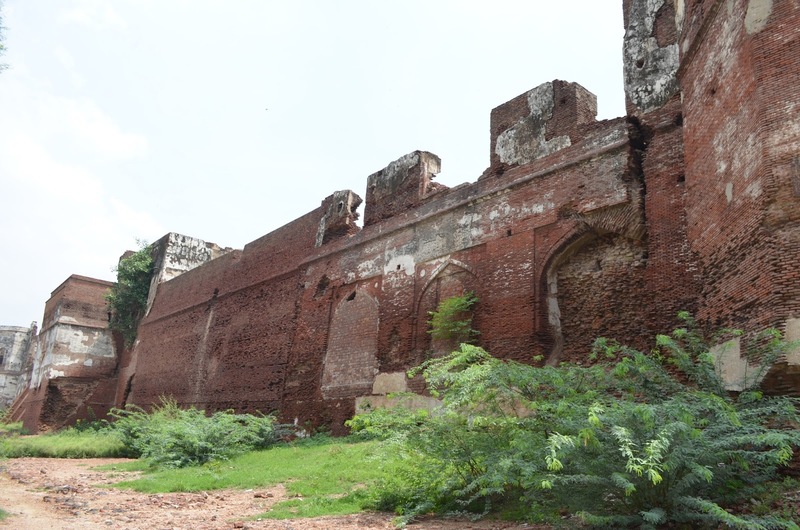 One remnant of this period may be the ruined halls and basement chambers at the northeast corner of the fort, which Jahangir and Shah Jahan may have used as a royal residence. The most impressive buildings inside the fort are the magnificent havelis (mansions) that were largely the product of the Sikh period and the latter Mughal era (the mid 17th to early 19th centuries). 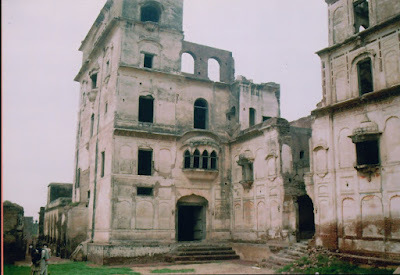 One famous occupant of the havelis was Maharani Datar Kaur (died 1838), the wife of Maharaja Ranjit Singh of the Sikh Empire. One thing is clear that a large part of this huge structure is buried. The ground inside the fort is as much as 10 meters high from the surrounding area, almost as high as the walls of the fort. The watchman also confirmed many large chambers, which are now almost inaccessible. 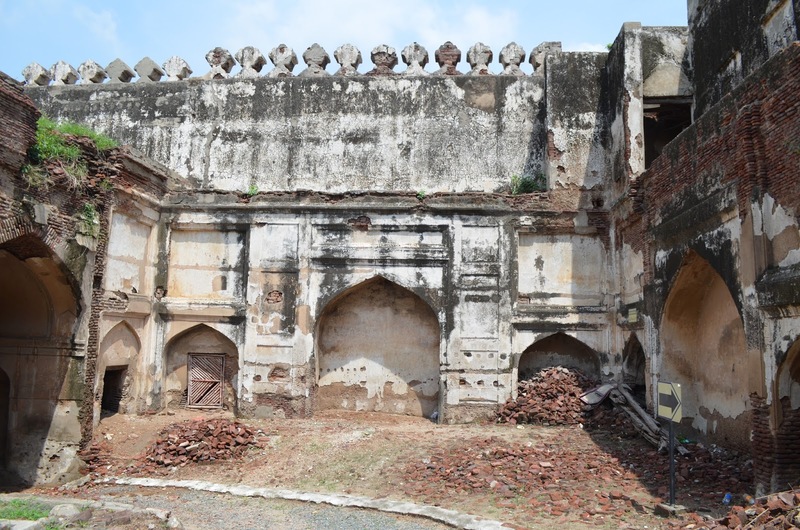 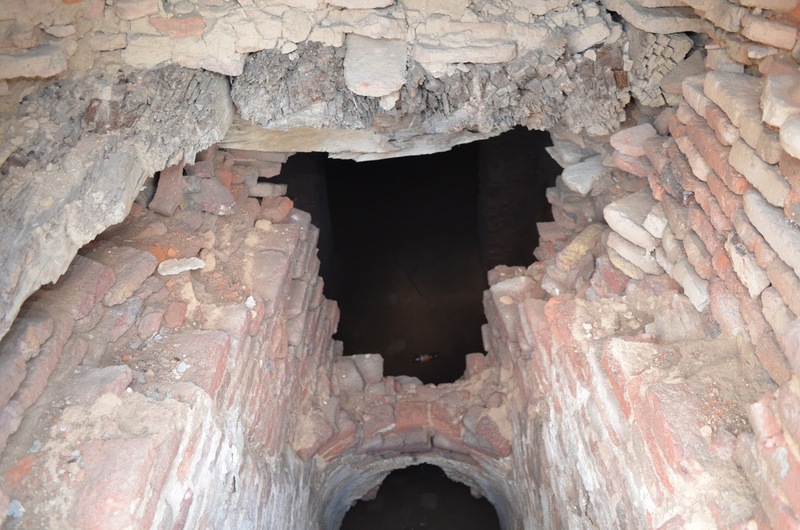 A proper excavation can reveal many hidden architectural treasures of this fort. 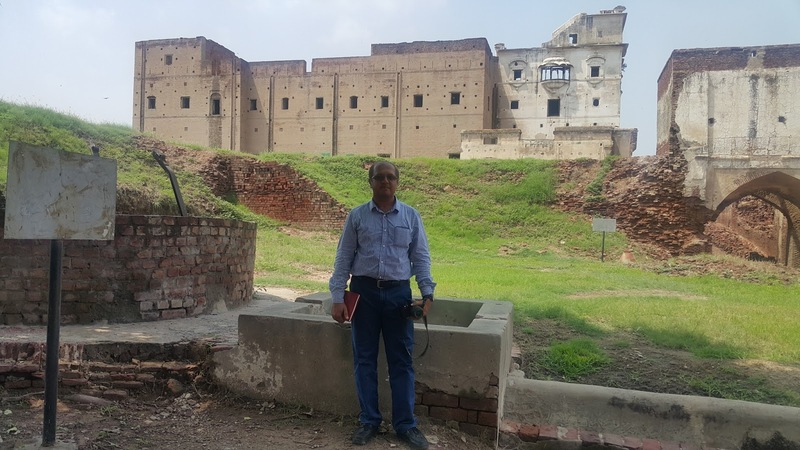 The archaeological department is doing a good job at the nearby Hiran Minar complex. 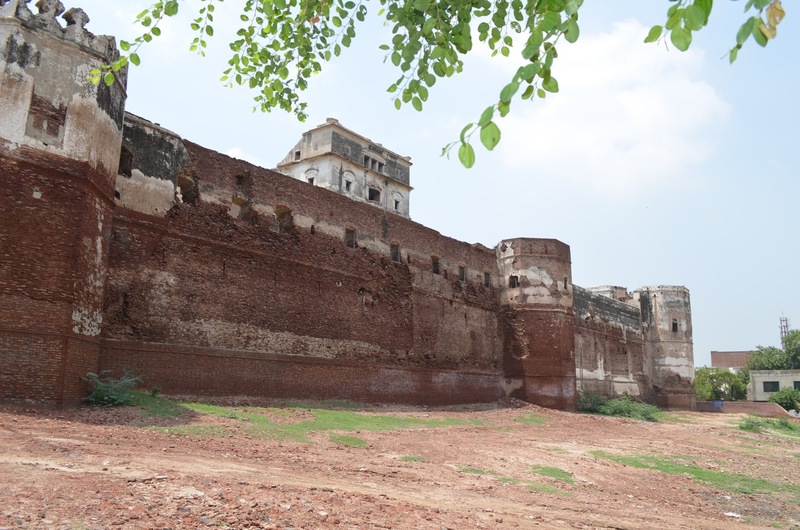 But this fort so far I think have failed to draw an attention, which it badly needs and rightly deserves. After restoration, this palace, can be used as a hotel and venue for cultural events. 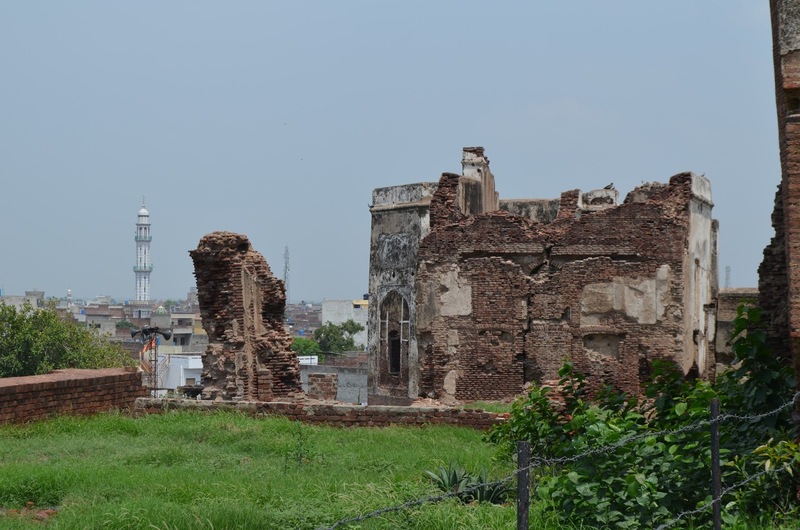 Anyway, if proper attention is not given, within a few decades it will just be a heap of rubble.